*Alternate title (according to my sister-in-law): "How to Raise a Viking"
Locate a pile of wool and fleece. Make sure he is dressed in a wool onesie (aka "body") and wool tights. Yes, even if baby is a boy baby, dress baby in tights. According to Norwegian folklore, it is of utmost importance that wool be the closest layer to the skin. Fleece elf booties complete the look. Dress the sleepy baby in a wool sweater and fleece overalls. a painstakingly knit over-sized wool bunting that is too cute for words. Wrap baby in a wool blanket. You now have a burrito baby. Place the burrito baby in a baby-sized sleeping baby. Most Norwegian mothers will insist on a down bag. Our baby has survived with fleece and polyfil. Baby is sleepy and ready for a nap! Place baby into the dark and cozy confines of his stroller. Baby should lie on a stroller liner made of. . .
you guessed it! Fleece and wool. 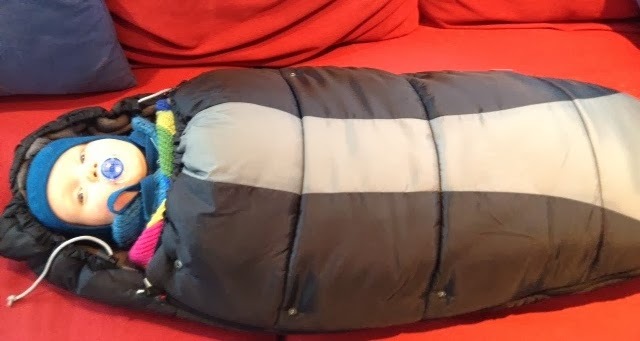 Cover the baby burrito/sleeping unit with a windproof-fleece-lined cover. If is is snowing/raining/sleeting, you may opt to cover your stroller with a rain cover. Ours has the zippers open for good air circulation. Take note of the baby monitor located in the basket under the stroller. This ensures that the baby's happy gurgles of delight are heard once he awakens in several hours. 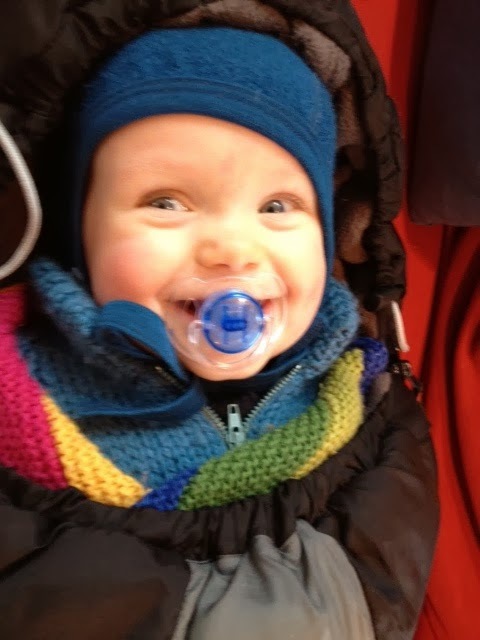 It seems that the general consensus is that babies not sleep outdoors in temperatures that are below -10C/10F. Thanks Lisa! I knew you'd approve of his name! Baby burritos are so awesome! He looks so happy as usual. How cute is your baby burrito!